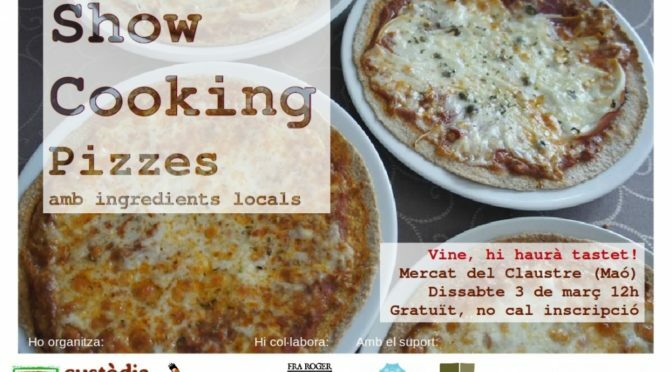 The pizza, made with environmentally friendly ingredients will be the centre of attention on Saturday 3 in the Market Place of the Claustre del Carme. Five types of pizza will be explained but all have in common a base made in Menorca from an old fashioned wheat flour. La Marcona, which is part of the Network of Agronatural Farms of Menorca, has revived a very old variety of mixed wheat which had been on the point of being lost. With this product, cultivated ecologically, much appreciated artisanal bread is made as well as pizza bases. GOB and Fra Roger have joined together to show how this resource used for cooking helps in island conservation. The cook blogger Rosa Rotger, passionate about Menorcan cooking, delights us with many pizza recipes made with products from farms which are part of the Land Stewardship scheme and which people attending are able to try. The event will take place on Saturday 3 March from 12:00 noon in the centre of the Claustre del Carmee Market. The event is free, open to all and without previous booking. The GOB shop, in the Market, sells the pizza bases of wheat flour and other products from the Network of Agronatural farms of Menorca, such as sausages, conserves and wines. It has been possible to carry out this event thanks to the support of the Consell Insular of Menorca.